Shoppers gather outside Toys 'R' Us on its very last day in Times Square, but many of the shelves inside were bare. 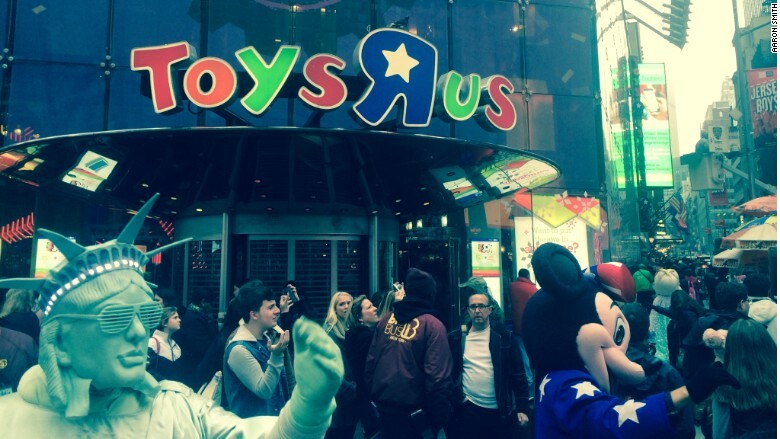 Customers packed into the Toys 'R' Us flagship store at Times Square for the very last time. Many of the shelves were already bare at midday, Dec. 30, since there wasn't much point in restocking. It was the last day of business for Toys 'R' Us in Times Square, where it's operated since 2001. "The most popular stuff is gone," said James Wagner of North Carolina, as he stood outside the store with a Toys 'R' Us bag full of Walker Candy. "You can tell they haven't restocked the shelves," said his friend Breanna Pavenski from New Jersey. Though she said there were a lot of "Star Wars" toys left, and a lot of board games. 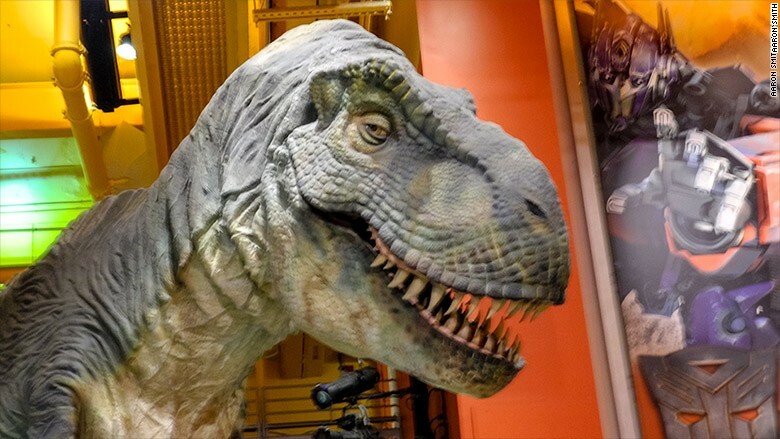 The store's Tyrannosaurus Rex robot was still there, and so was the famous 60-foot indoor ferris wheel. Al Robinson of Danbury, Connecticut, took his nine-year-old daughter there to ride the ferris wheel for the first and last time. "A lot of items are gone," he said. "A bare storefront on Christmas break in New York City? You know something's up." They were among thousands of people who packed into Times Square on the eve of New Year's Eve. Actors dressed as Mickey Mouse and the Statue of Liberty worked the crowd for tips as heavily armored police with AR-15s stood guard in anticipation of New Year's Eve festivities. Toys 'R' Us spokeswoman Alyssa Peera said the lease expires in January and the store was not renewing its lease "to realize meaningful rent savings." The store has been occupying 110,000 square feet in the building. "We have not signed a lease agreement for a new flagship location at this time, but we are actively searching for another location in Manhattan where we can welcome shoppers from around the world," she said. Toy 'R' Us hasn't said what will happen to the Tyrannosaurus Rex robot that's been inhabiting its Times Square store, which closes Dec. 30. Peera said that Toys 'R' Us was already trying to relocate employees to other open positions within the company, which has a dozen other stores in New York City, including Babies 'R' Us locations. Charles Moss, co-owner of the real estate company Bow Tie Partners, which owns The Bow Tie Building where the Times Square store has been located, did not immediately return a message from CNNMoney. Toys 'R' Us didn't say how much they were paying in rent. But the owners have been marketing the space at $2,500 per square foot per year for the ground floor, compared to $350 for the second floor and $150 for the basement. The ground floor is more expensive because it includes the storefront space.